Made it to Colorado! 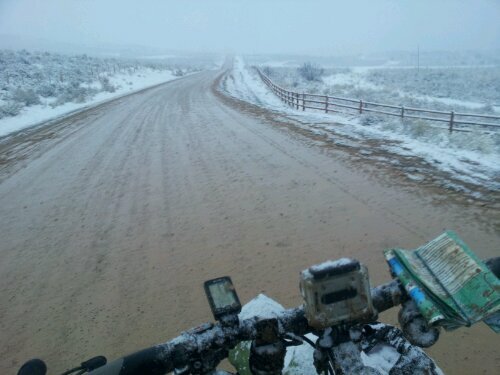 Started in Rawlins, WY and had an extremely tough day today; snowing heavily, lots of elevation, cold, muddy tracks destroying my gears, 80 to 90 miles… No place I’d rather be. Started at first light and arrived at Brush Mountain Lodge in the dark. 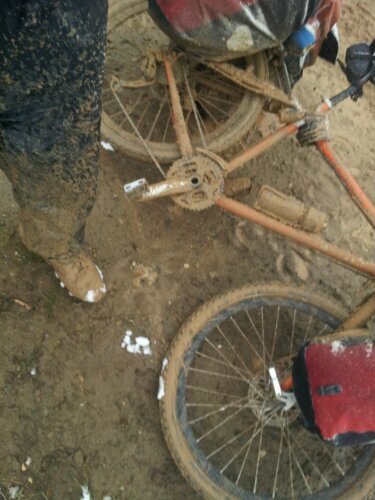 Had to boil water to get this hideous mix of ice, snow, rocks, grit, and road grime on both the front and back gears. At one stage I could only use one gear. It didn’t take long to lock up again. 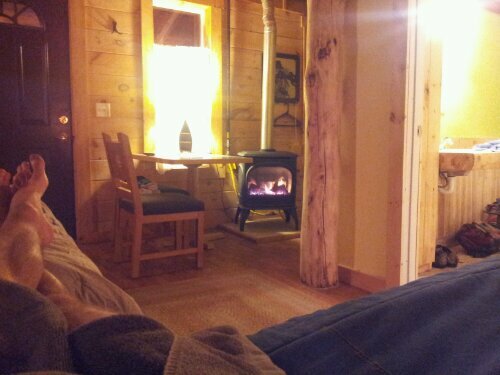 Now in the lodge with my feet up. Bed tonight; a rare treat. They’ve not seen anyone on cycling this trail since the beginning of September. In fact they’ce never had a cyclist this late in the year. For a good reason. 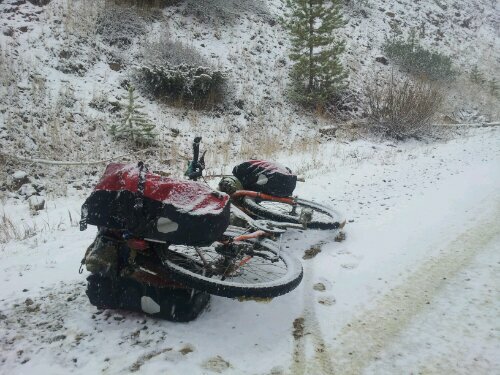 ‘I don’t have much experience riding in snow. I prefer to ski in that medium.’ Maybe you need to swap the bike for a snowboard! you are a stubborn man… What a gruelling trip. I am glad we are heading to Thailand to cycle. All the best and stay warm. Jen and I are watching your blogs and rooting for you. Ha ha, yeah it’s getting tough. Although until now it has been good sunny dry cycling conditions except for a few days; admittedly very cold at night! 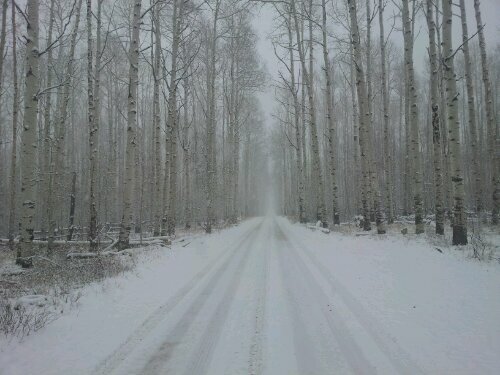 I’d highly recommend this route at an earlier time of year, it really is incredible. Have fun in Thailand! Hey Nick it’s the waitress who fed you in Steamboat Springs! I’m rooting for you too — it has been high 60’s and sunny here the past few days so I’m hoping the rest of your travels through the CDT in Colorado will be warmer than they were for you last week. Great hearing of your adventures and I’m stoked to keep updated! 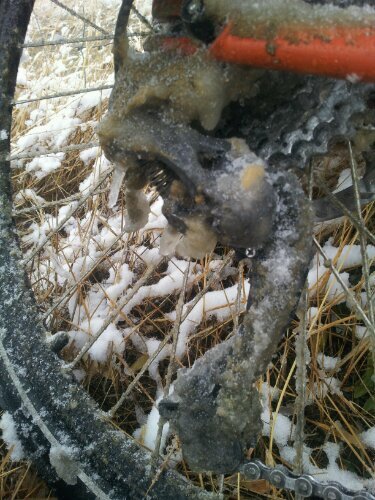 The ‘Ice up’ on the rear derailleur is extraordinary! Oil mixed with antifreeze a possibility I wonder?